Basic ingredients: Padmaja Kochera is a qualified civil engineer but a passionate and devoted Indian chef, food writer and all round enthusiast. She won BBC2’s Step Up To The Plate in 2008, appeared on ITV’s Britain’s Best Dish and has even played host to the Hairy Bikers. Having grown up with authentic Indian food, she now takes the template for simple, traditional dishes and applies her own contemporary twists. Fellow enthusiasts can pick up some tips at half-day and full-day courses held at Padmaja’s home in Thundersley, Benfleet, Essex for small groups of two to four people, Braxted Park in Witham and at various other locations in East Anglia. Her small home kitchen groups are very popular and cost £80 for three hours, including a four-course meal. 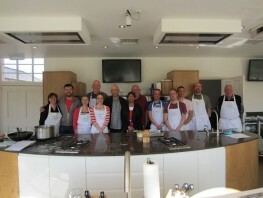 Full day courses are priced at £175, including all the ingredients. The class vibe is convivial, features a brief culinary history lesson and hands-on cookery with wine, recipes and an ‘elaborate dinner’ included. They say: My Friday Supperclub has always been sold out. It’s a full hands-on evening learning the sort of simple authentic Indian dishes you never find in restaurants. We say: Padmaja’s fantastic website reveals recipes for dishes such as ‘lentil doughnuts’, proving that, when it comes to Indian cuisine, she has something fresh and exciting to offer. With food this intriguing, it certainly seems worth exploring a little further.